Thanks to the discussion on Titan Ridge and valuable input by @karatekid430 and @joevt3, I decided to try a Gigabyte GC-Titan-Ridge add-in card with my Threadripper desktop. Level1Techs recently showcased a similar setup in Linux. I'm beyond excited to share we can get them working in Windows too. The L1T video indicated there's reverse-engineering involved. Well, all I did was plug-and-pray. With some experience playing around eGPU and Thunderbolt 3 in the past few years, I went for it and hoped for the best. I believe the crucial component to make this work is the new GC-Titan-Ridge. My ASRock X399M Taichi board does not have a Thunderbolt header. There's no hacking or modding BIOS settings at all. I simply connected 2x 6-pin PCIe power cables and the USB 2.0 header cable to the GC-Titan-Ridge AIC. I proceeded to attach the Thunderbolt 3 device then booted my system up. The only software I installed was Intel Thunderbolt Software version [17.4.77.400] from Gigabyte support website. I tested several TB3 devices and hot-plug seemed to work. Thunderbolt Software even showed this Threadripper system has support for External GPUs :D.
I built this system with no intention of adding Thunderbolt 3. I guess this is now my test bench because the X399 platform is amazing. 66 PCI lanes afford me the ability to connect Thunderbolt 3 devices directly to the Threadripper CPU. Windows 10 currently boots off a RAID0 of 4x NVMe drives. Memory modules are overclocked to 3600 MHz in quad-channel arrangement. I have not found a good CPU cooling solution so I'm leaving the 1950x alone while running the stock OMEN X AIO cooler. Here are synthetic benchmark results in AIDA GPGPU and Unigine (ran through USB-C port from RTX 2080 to AOC portable monitor. Titan Ridge is a pivotal controller that has provided features and functionalities not seen in older Thunderbolt controllers. I hope more devices and computers will use this new controller to bring cost down. And now, for something truly crazy: Take an m.2 to PCIe x4 adapter. Grab a laptop of SFF desktop with an m.2 slot. Plug the GC-Titan-Ridge into it, and see if the TB3 controller works. I will test this AIC with a few non-support systems next. I have a feeling the card has to connect to the CPU rather than the Chipset in order to work. Finally a working TB3 solution on AMD platform. Bravo! I have a crazy idea to get one of these and see if my old NUC with the fried TB1 controller will work with one of these. An academic question, at best, since I only have mPCIe as a possible connection, but the system supports TB of some sort, so I wonder if this would work with it. That would be fun if your NUC works with this AIC. One of the systems I will test is the 2010 Mac Pro tower. 10.14 Mojave installer contains firmware update for this old Mac so my hope is that Thunderbolt 3 may work through the GC-TITAN-RIDGE. @itsage I cross-posted this at MacRumors. A lot of folks will be interested in the results of your 5,1 testing. If this works, cMP will finally have the legs it deserved from the factory. I tried pairing with an AMD eGPU. It worked the same way, no error 12. Please get pciutils for Windows and as Administrator, post the output of "lspci" and "lspci -vt". Cheers! @yukikaze from my testing so far, the indications are that it will work in M.2 - but the real question is can it work in VROC with bifurcation, or on PLX switches. I guess I could open my Surface Pro 4 again and do it with that (although the pos only has PCIe x2 to the slot) but not until after university semester ends. theitsage just showed it working on a system with no support whatsoever and no awareness or concept of Thunderbolt whatsoever. It will likely work, but it will be ugly until PCIe 5.0 comes with optical cabling, or Gigabyte finally decide to release their TBT3-Bay that runs off U.2 port (product likely canned). But mPCIe is only PCIe x1 so I am not sure it is worth bothering. You can get one of the new 2018 NUCs and repurpose the RAM and SSDs from your old NUC, likely. And then put the old NUC in the oven if it is worth the risk to try to get the controller working again. Or give it to a computer illiterate person who could not comprehend the significance of Thunderbolt. It was mostly an academic question and to do something really weird. It won't be worth it in the practical eGPU sense (native mPCIe works on that system and would perform better anyway). @theitsage Any chance you could test it with consumer grade platform ? Like for example Asus prime x470-pro ? While I very much like the fact that it works with Ryzen, I would really like to see it connected to some cheaper pc. Threadripper is a little bit an overkill for my needs. @damians555 I have a B350 system but it's an ITX running Ryzen 7 1700. There's only one PCI slot for the GPU. I will see if I can get a Ryzen 3 2200G for testing purpose. One behavior I noticed in the past week is something we've seen in laptops with eGPU enclosure connected. When the system is fully turned off the fan/s on the eGPU enclosure may run. This is what's happing with my X399 system. With everything completely off, the CPU fan is running at a slow speed. I believe this is related to power delivery and dictated by the AIC's firmware. Sub'd just for any inputs on a cMP 5,1 w/this card. Optimistic and extremely curious if this can really work. If that's the case, I will be very surprised. That's a very odd distinction. Can you please test hot-plug support? If you boot up Windows without any TB devices connected(! ), will it detect and make usable new devices? @bootrear I tested more Thunderbolt 3 devices and hot-plug is not fully working. While it can hot-detect a connected device, the device is not functional unless it was connected prior to boot. 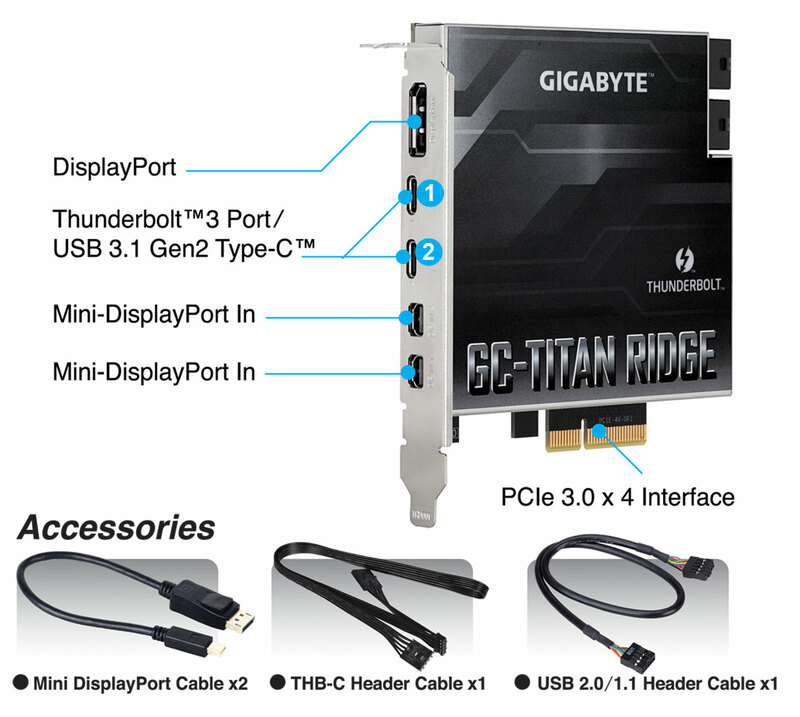 Also the GC-Titan-Ridge can work without any PCIe power cables connected. @itsage pretty please give me output of "lspci -vt" and "lspci -vv". You can get pciutils for Windows if you do not have Linux. On Windows, you have to be Administrator to run lspci command - Windows must have tighter permissions for read access. On Linux, you can get most of the information as a normal user (but some modes can be more verbose as root). I need to know how the PCIe slots are wired and which segments each are on. Because Threadripper has two PCIe root complexes, there are two sets of bus numbers. If you can figure out which PCIe slots are on which segment (including the 3x M.2 on the motherboard) then that would mean a lot to me. In planning a build, I need to make sure that only two Titan Ridge cards end up on each segment to ensure there are enough bus numbers (I am planning for four). Please also tell me what PCIe bifurcation options are available in BIOS. Can you turn all of the fully functioning x16 slots into x4/x4/x4/x4? What about x8/x4/x4 and x8/x8? @karatekid430 On my ASRock X399M Taichi motherboard, I can set all 3 x16 PCIe slots into x4/x4/x4/x4 slots. There are no options for x8/x4/x4 or x8/x8. I also noticed there's mention of "external graphics card" in the Fast Boot option. I will take screen captures of these sections in BIOS. I attempted running pciutils for Windows this past weekend. The Command window flashed then quickly disappeared. Can you provide the step by step to run it in Windows 10 to get the output? I saw two PCIe root complexes in HWiNFO64. I will expand both to provide more information if I can't get pciutils for Windows running. I attempted running pciutils for Windows this past weekend. The Command window flashed then quickly disappeared. Thanks for your efforts testing all this! I was able to run lspci after adding WinIO.dll to Windows system folder. The output was too long so it's attached in the txt file. Also here are the BIOS screen captures. The next AMD system to test is a Ryzen 5 2400G. I was waiting for the InWin Chopin ITX case to come back in stock at the local MicroCenter. New inventory arrived yesterday so I spent last night putting together this NUC-like AMD system. It's incredibly small compared to the other ITX cases I've seen. Here's a photo next to a PS4 controller for scale. Update: Here's the successful Thunderbolt 3 AMD Ryzen 5 2400G build. I did something similar in a 2008 Mac Pro. I used an amfeltec gen 3 x16 carrier board which has four M.2 slots. The carrier board is expensive because it uses a PLX chip but that is necessary for four M.2 slots, plus it has the benefit of converting the fast narrow PCIe 3.0x4 of the GC-TITAN RIDGE to the slow wide PCIe 2.0x16 of the Mac Pro to get near full performance in an old computer (one made before Thunderbolt even existed). Since the ASRock X399M Taichi board supports bifurcation (the slot 1 x4x4x4x4 option), a less expensive multi M.2 carrier board might be useable. This could give you four slots to play with. Speaking of old computers, I would try the GC-TITAN RIDGE (with or without M.2 carrier board) in a Power Mac G5 (Late 2005), but the G5 only runs macOS 10.5 so there's no USB XHC or NVMe drivers. There's a NVMeGeneric.kext but no source code is available so it can't be recompiled for PowerPC. There's a GenericUSBXHCI.kext with source code but it might not be possible to make it work with an older OS or PPC processor. But still, if it's possible to get past making a Thunderbolt peripheral usable without launching Windows first (not there yet) then at least SATA/AHCI raid may be possible over Thunderbolt. Another possibility is Linux but I think people stopped making Linux distros for PPC. My Mac Pro 2008 setup had stability issues. Maybe doing all four M.2 slots with multiple folds in the cables was too ambitious (I wanted to try two GC-ALPINE RIDGE and two GC-TITAN RIDGE). The cables I used were ADT 50cm R42SL. I think it would be better with a shorter PCIe 2.0x16 riser or cable, one or no folds, then use non-cabled M.2 to PCIe x4 adapters. The shorter lengths and slower speed of such a riser may have better stability. The amfeltec is low profile and therefore has two M.2 slots on each side. A card like the HighPoint SSD7101 with all M.2 slots on the same side (full height) might be better for layout purposes. @theitsage FYI hotplugging also does not work with the TB3 header connected on the AORUS XTREME X399 board (perhaps BIOS support is required here). The card is detected in Windows 10 without a device connected, though. Re: bifurcation, I'm not really following what that is about. Do I need that to support multiple external multi-drive NVME enclosures through these TB3 ports? @bootrear Thank you for your input with GC-Titan-Ridge on AORUS XTREME X399. Full hot plug functionality may require proper certification from Intel so that vendors can update their BIOS as well as Thunderbolt 3 firmware if needed. I assume the Thunderbolt 3 device work after a warm boot with your setup? Haven't tried yet, but I will soon. @theitsage - I can confirm I have this working in a 2012 5,1. Preliminary tests with GTX 1080 and LG Ultrafine 5k in Windows 10, superb. Then RX 580 in Mojave driving the Ultrafine and a OWC Thunderbolt 2 Thunderbay4. I never thought I'd see the day that Thunderbolt would be alive on a 5,1. Very stable (except for sleep) with my testing so far. I've posted some stuff over at Mac Rumors. Cold boot to MacOS right now is not out of the box, must first pass through Windows. Would love to help form a group if anyone is interested in figuring out how to make this work on Mac boot. But right now, just happy to use a 5k UltraFine's I had collecting dust with my 5,1. I have full display controls (brightness, FaceTime camera, mic in, and speakers) from the thunderbolt controller. Also, additional USB ports on the back of the display are working as intended. Tested with a USB-C to lightning cable connected to my iPhone. Pretty nifty! @rawweb Thank you for the update. Titan Ridge is really a remarkable controller for Thunderbolt expansion. It's very interesting to note all the other changes Apple is rolling out for the Mac Pro tower via firmware updates. First it was NVMe native boot support and recently RTX series GPUs with boot screen. Thunderbolt 3 connectivity is icing on the cake. This gives me hope the new Mac Pro is closer to the tower form than trashcan. @itsage If the new Mac Pro is even close to the tower-style system (but smaller), I'd say it would be a huge step up for Apple given what we've seen so far from them (namely: solder-it-all). Mac mini rumors are swirling as well. Let's just say I have some expectations for the Oct. 30 event. @Mac_editor you and me both buddy... I'd love a Mini with a 15inch MBP's internals. wow this is good news! thanks for the update. So this titan ridge add in card made the MP 5,1 tower system work with TB3 eGPU? Slots are PCIe 2.0 , right? I'm a little confused... I thought motherboards needed to be intel TB certified to be able to use thunderbolt? Or is this titan ridge add in card our golden ticket? Trying to use on gigabyte aorus extreme X399 with latest F4 bios, header cable, usb2 cable and both power cables. Won't even charge or deliver power to things plugged in. The only way I know for sure the card is present and its firmware is active is after I shut down it keeps the board lit up and gpu fans spinning. Installed the latest thunderbolt driver package on gigabyte's website, but nothing showing up even in device manager or on the pcie buses at all using hwinfo64, so don't see how it would make a difference. Why the hell does their product work on a totally different vendor's board without a header but not their own? It’s great news! Yes indeed, appears to work. Right now booting to windows seems to be a requirement so the drivers can enumerate the card and assign proper resources. wow this is good news! thanks for the update. So this titan ridge add in card made the MP 5,1 tower system work with TB3 eGPU? I don't think anyone's tried a TB3 eGPU with any of the classic Mac Pros yet. Slots are PCIe 2.0 , right? I'm a little confused... I thought motherboards needed to be intel TB certified to be able to use thunderbolt? I believe there are posts in this forum regarding PC laptops with Thunderbolt 3 controllers that use a PCIe 2.0 x4 connection. Other possibilities are PCIe 3.0 x2 and x4. PCIe 1.0 also works. In my Mac Pro 2008 (which has both PCIe 1.0 and 2.0 slots), the GC-TITAN RIDGE works in either slot, and in a PCIe 2.0 slot boots into PCIe 1.0 speed but can be set to PCIe 2.0 speed. The different speeds limit the PCIe bandwidth but not the functionality or DisplayPort bandwidth. Intel never (probably?) had to require TB certification to make the technology work. It just helped to give users a reason to buy new motherboards and new CPUs to go with those motherboards. It's the same with any new technology - why allow upgrading the BIOS of old computers to allow using a new feature when you can sell a new computer instead? Or is this titan ridge add in card our golden ticket? @joevt3 TB3 eGPU is working with my 5,1 running Win10 1803 + GC-Titan-Ridge. I used the Mantiz Venus enclosure and Radeon Pro WX 9100. AIDA64 confirmed x4 PCIe 2.0 connection for AIC.